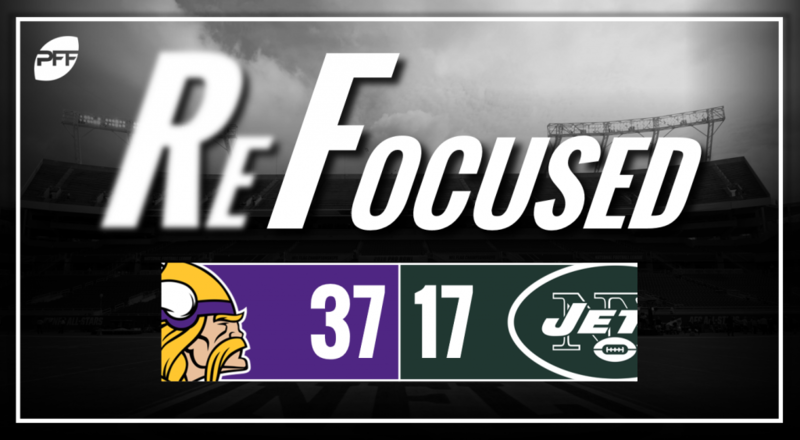 The Minnesota Vikings defeated the New York Jets, 37-17, in Week 7 of the 2018 NFL season. Make it seven straight games with at least 100 receiving yards for Adam Thielen, as he hauled in nine passes for 110 yards on 10 targets. Thielen and Stefon Diggs were Cousins’ go-to receivers, accounting for 17 of the 25 total receptions, but for the second straight week, the Vikings were also able to establish a respectable run game, with Latavius Murray racking up 69 yards on 15 carries. The Vikings’ defensive front played very well against the run, as they limited the Jets to only 71 yards rushing yards. The play from the defensive tackles was too strong for the Jets offensive line, and that allowed linebacker Eric Kendricks to flow to the ball quickly. The Vikings secondary had a relatively easy day, as Sam Darnold endured his fair share of struggles, but part of that was due to the secondary, who played tight coverage all game long. Sam Darnold struggled with accuracy on short to intermediate passes, and he completed just over 40% of his passes all game. He received little help, as many throws were in tight windows due to strong play from the Vikings’ pass defense. The Jets offensive failed to establish the running game, especially once Bilal Powell went down. However, the Jets’ offensive line did do a decent job in giving Darnold sufficient time to pass. Cornerback Darryl Roberts had an up and down game, as he got beat early for a 34-yard touchdown by Adam Thielen before he bounced back with a couple of pass breakups. Second-year safety Jamal Adams laid a couple big hits on the Vikings and impressed in run defense. He finished with three tackles for loss and nine total tackles. Minnesota: The Vikings did just enough on the ground, which allowed their play-action game to open up. Thielen surpassed 100 receiving yards for the seventh straight game and ultimately helped the Vikings get their third consecutive win. New York: The Jets were overmatched for the majority of the game, as they were unable to get anything going on the ground.